A South Korean woman became pregnant with 12 baby squid after eating calamari. Really. We are not kidding. Even by The Freaky’s standards this is a truly bizarre and odd story. The 63 year old woman was eating a whole cooked squid when she felt a sharp pain in her mouth. 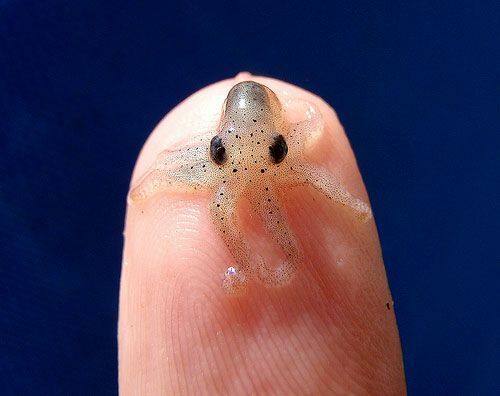 She visited doctors and when examined the doctors found ‘baby cephalopods’ attached to her mouth. These are small pods, covered in a cement-like material to make them stick. Inside the pods is an ‘ejaculatory apparatus’ and squid sperm. Normally a male squids would discharge this sperm mass and it would attach to the skin of the female or deeply embed in her skin or muscle. But in this car they attached to the inside of the woman’s mouth. In December 2011 a similar weird case was reported when a woman in Japan had squid sperm bags removed from her mouth after eating raw squid. Incidents involving the impregnation of human mouths appear to be confined to the Far East where, generally, more raw fish is eaten. When squid is prepared in the west, internal organs are removed meaning there is no risk of eating spermatophores. this is a very strange story, I didn’t know such things were possible.